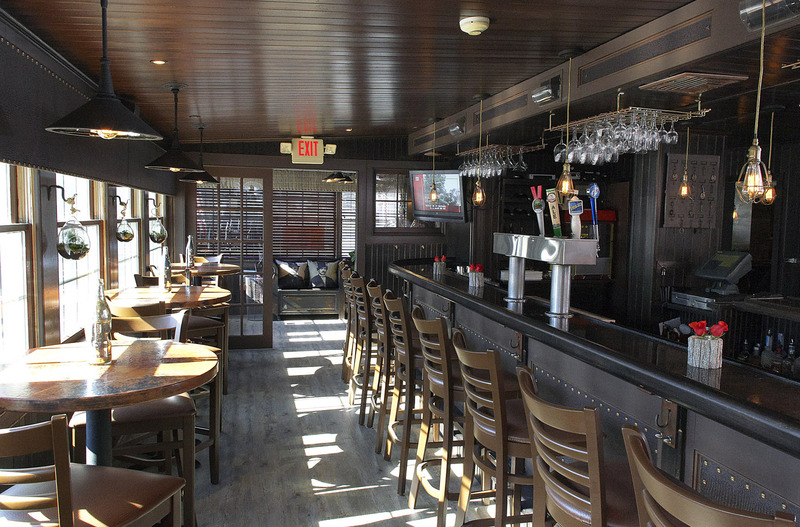 Bowman’s Tavern, a restaurant with a loyal following just outside of downtown New Hope, Pa., was a commercial interior design project with an added degree of difficulty: The entire installation needed to be done in 10 days. But the planning and preparing for that stretch began a year earlier. The renderings were approved, the materials, bought and stored in a warehouse. So it came down to aligning all of the subcontractors for that brief stint—and then ensuring that we didn’t trip over each other. Somehow, we managed. Actually, it turned out to be one of the smoother installations I’ve ever been a part of. With so little breathing room, we replaced the flooring and addressed the walls at the same time, wrapping them in weathered wood and hanging wallpaper in spots. That part was the trickier end of a long list of logistics. We also reupholstered the banquettes and bar stools, painted, crafted an intimate staging area around the grand piano, and added lighting, lots and lots of lighting. To keep costs in check, we re-stained the bar stools and chairs rather than replace them. Dismantling the bars–there’s a larger one in the front of the restaurant and a smaller one in the back–and rebuilding those, likewise, would have been too much of a hit, so we refinished those, too. The tavern was a unique breed. Its interior was dated and lacked any genuine character, yet locals swore by it. I felt it had a certain image to uphold: rustic roadside pub. And that became my inspiration for the redesign. I focused on implementing a warmer palette, including dark wood tones, with the aim of creating an intimacy that a restaurant of a modest size promises. The owner loved the result. Maybe even more importantly, his guests responded to it with every bit as much enthusiasm. In the first month after the makeover, the tavern tripled its revenue from the same period the year before. Always music to my ears. After all, improving the bottom line is the basis for every commercial interior design project, whether it’s explicitly stated or not. My favorite parts will likely go unnoticed by most diners, and I’m totally OK with that. In the wait station, we installed flooring that matches the look of repurposed barn wood that runs throughout the restaurant, but this particular section is made of rubber, so it has a little bit of cushion to it, just enough, hopefully, to lessen the strain of a long dinner shift. That weathered wood that we wrapped the walls with isn’t repurposed either. Because of restaurant codes, it needed to be fireproof. So it’s specially treated wood that we faux-aged. Those two features are part of why I’ve come to embrace commercial interior design. It’s not just about crafting a thought-provoking space according to a desired aesthetic. It’s about crafting it so that it behaves as smart as it looks.